Description: Level: Aimed at everyone who is interested in traveling and learning, exploring and witnessing different cultures, and humanity's everyday life on Mother Earth. 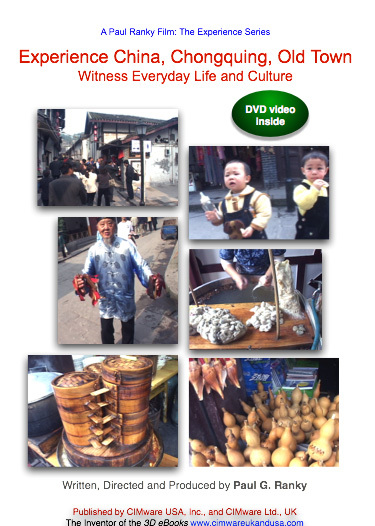 Contents: This electronic publication is a professional quality DVD video experience of Chongquing, Old Town, in China. Chongquing is a province of about 32 million (!) people in one of the hottest, most humid regions of China. It is one of China's biggest municipalities as well as one of the largest cities in the world. It is a major economic center, a hub of large rivers, land, and air transportation in Southwest China. It is also called the 'Mountain City', or 'River City' and noted for its scenery. It is situated at the upper region of the Yangtze River, where the Yangtze River and Jialing River join. Chongqing is a very old, cultural city with a recent history of over 3,000 years. It is the birthplace of the Bayu culture. Towards the end of the Old Stone Age approximately 20,000-30,000 years ago, mankind began to live here. During the Shang Dynasty (1766-1122 BC) and Zhou Dynasty (1022 - 221 BC) Ba people founded Kingdom Ba and made Chongquing their capital. In all dynasties since the Qing Dynasty (1644-1911 AD) this region was for most of the time a unified administrative region with Chongquing being the center. Earlier it was called Jiangzhou, then Bajun, Chuzhou, Yuzhou and also Gongzhou. In 1102, in the first year of the reign of Emperor Chongning of the Northern Sung Dynasty, it was renamed Gong Prefecture. Then became prince of the Gong Prefecture. Zhao regarded his two ascensions to be a double cause for celebration and therefore changed the name of Gong Prefecture to Chongquing, meaning 'Double Celebration'. Although protected by a wall since 250 BC, Chongquing was plundered during the rebellion of Zhang Xianzhong (Chang Hsien-chung) in the 1630s. In 1891 Chongquing became a major river and land transportation port with significant industry. In 1929, Chongqing was formally made a city. During WWII Chongquing was targeted by enemy forces due to its industrial power. At the time of filming, this rapidly changing and developing city is challenged by enormous levels of industrial air and water pollution, traffic and public transportation problems. The major ecological changes are due to the lack of water in the rivers, and the accelerated industrial growth, that offers new opportunities for some and intends to leave many others behind... Some residents claim, that they haven't seen blue skies in Chongquing for the past 10 years... This film attempts to capture the spirit of this old town by offering an objective view, a personal experience, with original images and sounds (no narration), to witness everyday life and culture in this part of historic China. System Requirements: DVD-ROM: NTSC standard definition (SD) DVD video player for TV, or computer. Approximate length 27 minutes, in 4:3 regular screen format, or any good computer screen (min. 800 x 600 resolution). Also available in PAL, as well as for the Video iPod. Please visit www.cimwareukandusa.com for available formats and further products. We cover a wide variety of products and services in the area of Product Lifecycle Management PLM, Advanced Design Engineering, Product / Process Design Engineering, Manufacturing, Total Quality Management, Multimedia, 3D web, Medical and Biomedical Engineering, Engineering Multimedia, Case Based Learning, Problem Based Learning, Context Based Learning, Virtual Product Demo, Design for Environment, DFE, Design for assembly, 3D web-objects, Object Oriented Design, Programming, Computers, Concurrent Engineering, Rapid Prototyping, Advanced Design, Manugacturing, Automation, Robotics, Flexible Manufacturing, Asembly, High Tech, Hi-tech, Computer Science, and Information Technology. Our sponsors and/ or collaborators include NJIT, BMW, MINI, Daimler-Chrysler, IBM Dassault Systemes, DELMIA, Department of Defense (USA), EDS, Emerald Publishers, Festo, Ford Motor Company, Genrad, GM (General Motors), Hardinge, IBM, IMI Norgren, Kessler Rehabilitation Institute, MCI, New Jersey Medical and Dental School (UMDNJ), Mercedes Benz, Nissan, Acura, Lexus, Honda, Infiniti, OKUMA, Northrop Grumman Corporation, Information Technology and Defense Enterprise Solutions, USA, Logis-Tech, Inc., USA, HK Systems, USA, EasySoft Corporation, Yamazaki-MAZAK, Rolls-Royce, Bentley, Siemens-Plessey, Kistler, Denso, Rockwell Automation, Springer Scientific Publishers, Taylor & Francis Publishers, Springer Scientific, Fanuc Robotics, General Motors, GM, FLOW, Hexel, LEGO, Kluwer Academic Publishers, Toyota, Oakridge National Laboratory, Sekisui Automotive Japan, Yamazaki Mazak, and many others. This site is listed as a reference source in the directory of the NSF (National Science Foundation, USA) National Center for Manufacturing Education, www.ncmeresource.org.